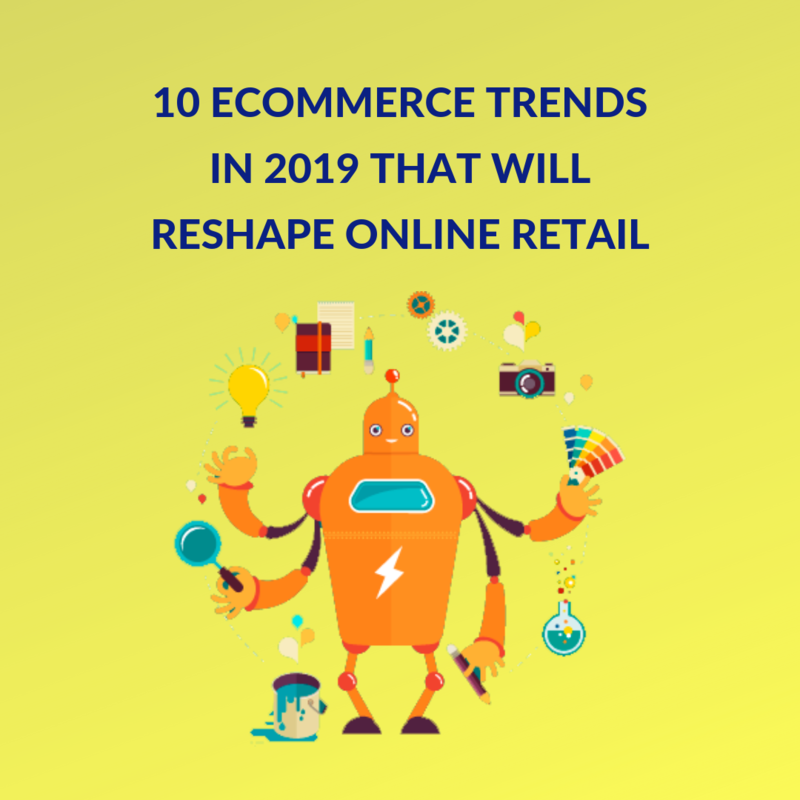 Digital transformations, phenomenal sales numbers, technological advancements and volatile consumer expectations are all defining and shaping future eCommerce trends in 2019. Where on the one hand retail and eCommerce trends are becoming synonymous to understanding customer expectations and delivering what they want, on the other hand there is a constant struggle to meet these expectations at each stage of the customer journey. The good news – however – is that customer confidence is now at a all-time high, and if you look at eCommerce trends in 2019, the retail eCommerce sales continue to show an upward trending graph. Download your guide and learn why online stores gets visitors but no sales in return and how to recover from it. 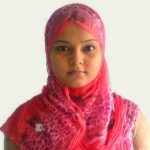 There are companies, which have thrived and been profitable because they have constantly stayed abreast with the trends of eCommerce. So we can easily comment that, what will help you sustain your online retail business amidst extensive competition is to bank on the latest eCommerce trends in 2019. If you’d like to take your eCommerce presence to the next level, read on to learn about the eCommerce trends that I am going to talk about here in this article. Let’s be very honest here. The eCommerce businesses that have survived have done so because they kept up with the changing online retail technology trends. Growth of mobile commerce, AI (or in other words, Machine Learning integration) virtual reality in online shopping, evolution of the search functionality – are all examples of eCommerce driven by technology. The eCommerce businesses that have survived have done so because they kept up with the changing online retail technology trends. – Tweet This! AI has already invaded online shopping trends, 2019 being just another year taking it further. For instance, chatbots are already fulfilling several customer service needs – from answering their questions about a product to addressing a complaint or taking feedback. Powered by AI, these chatbots learn from customer interactions and conversations and evolve into something even better with every conversation, giving customers a personalized eCommerce experience. AI reduces friction in the buying process, and will continue to define online retail eCommerce trends in 2019. It is this use of Machine Learning that enabled Amazon to introduce the world to its Alexa voice assistant; to allow shoppers to buy products and exit Amazon Go grocery stores without passing a checkout. Such is the power of AI in eCommerce. AI has been helping eCommerce businesses to shrink that sales funnel, and that is always a good thing. Take North Face XPS for instance. It is a chatbot powered by IBM Watson. 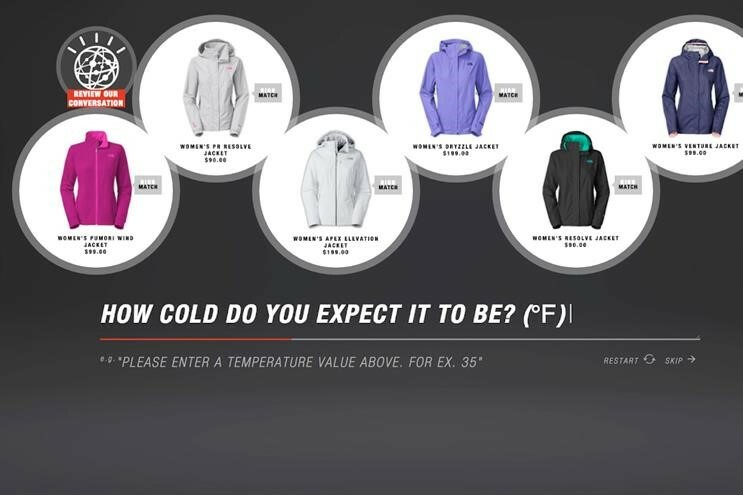 This recommendation tool asks a shopper some basic questions, and does additional research to find out the weather conditions in the shopper’s location. The result is that the customer gets several most relevant buyable options to consider. XPS and similar other AI-powered chatbots are critical because they allow the consumer to speak to the computer in the same manner as he/she would to another human being. It also removes the need to type, thus removing friction often associated with online shopping. Amazon has used AI since its earliest days to come up with product recommendations. And now these recommendations are so accurate that it’s almost like your personal shopping assistant. This is all thanks to the advancements with Machine Learning. Upsell or cross-sell your products, because real time AI-powered recommendation engines are able to analyze online customer behavior and anticipate their needs to be able to influence their buying behavior. Do a fact-based segmentation of your shoppers. The data gathered by these AI engines can segment a customer base more efficiently, leveraging more subtle criteria, like particular product preferences or shopping behavior. Create amazing email marketing campaigns, not to forget that email blasts improve transaction rates by 600 percent. These email campaigns can reduce your cart abandonment, initiate a one-on-one conversation with your customers and take feedback for the products they have purchased. Basically you are earning by earning trust. 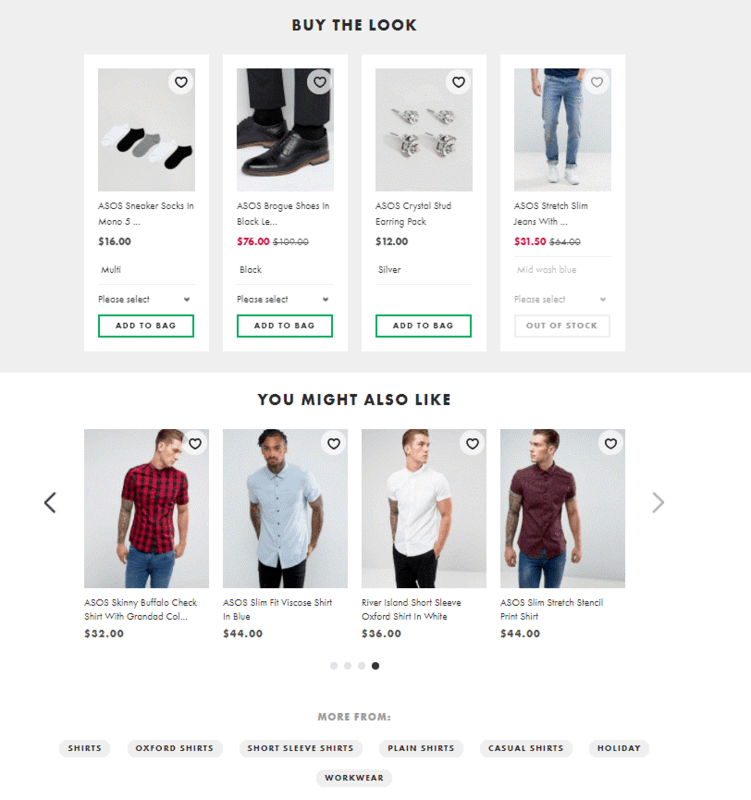 ASOS in the following example helps its customers to buy the entire look with the help of personalization. Voice searches will be 50% of all searches by 2020. People owning devices like Amazon Echo and Google Home are already buying products through voice search. Even children who cannot write or type can use voice search to find their favourite videos online. That is the power of voice search we are talking about. Optimizing for eCommerce store for voice search would mean answering questions like how, where, how many, what and so on. In order to improve voice search capabilities for the eCommerce store, you need to make use of long-tail keywords. And as voice devices can read out your product’s descriptions, you’ll need your product descriptions to be descriptive yet succinct. And if you still aren’t convinced, content that is voice search friendly now gets search engine priority and wins the most coveted Google smart-answer snippets, which every company is seeking to gain. It is also been predicted that voice assistants are the digital medium from which consumers will get to discover new products and services in the future. The main difference between Augmented Reality (AR) and Virtual Reality (VR) is while the former adds digital elements to a live view (with a smartphone camera), the latter shuts out the physical world completely. 2018 saw AR take a huge leap forward as many online brands rolled out features that allowed customers to visualize items in their own homes before making a purchase. AR is now being seen to impact visitor engagement significantly and combat the $260 billion return problem across eCommerce businesses worldwide. Shopify store Horne adopted AR in 2018 which improved their customer engagement manifold. 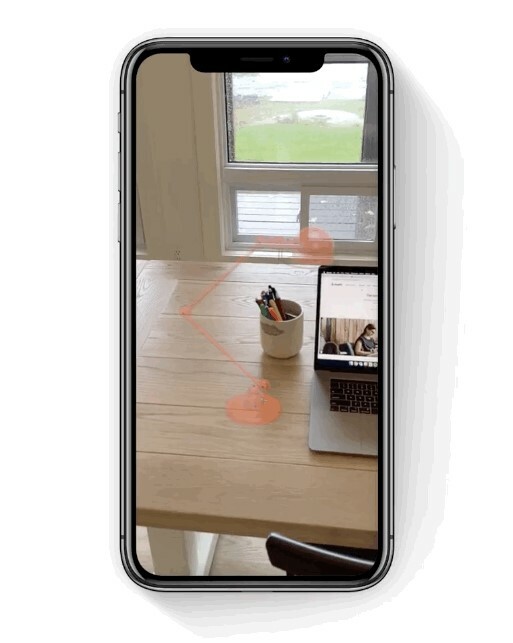 Shopify’s ‘Shopify AR powered by 3D Warehouse’ and a growing number of 3D modelling experts, have made it extremely simple to integrate AR into ecommerce stores. While for your consumers, this means richer buying experiences, enabling them to ‘test out’ homeware products within their homes and ‘try on’ clothes and accessories, for online merchants like you it means higher conversions and fewer returns. In the above example Shopify allows its customers to view realistic and interactive versions of products in AR. Sweedish furniture giant IKEA launched an AR catalog app, which allows users to see how certain items of furniture would look in their homes. eCommerce retail trends also show merchants adding a new level of intrigue to the online shopping experience, by building virtual showrooms or virtual stores. These platforms offer customers a virtual experience, which is very similar to the one inside the physical store. And while home improvement businesses are now increasingly using VR to give the user a ‘mocked-up’ version of how their home could look like when fitted with various items or products, it’s not just this space, which is moving to VR. 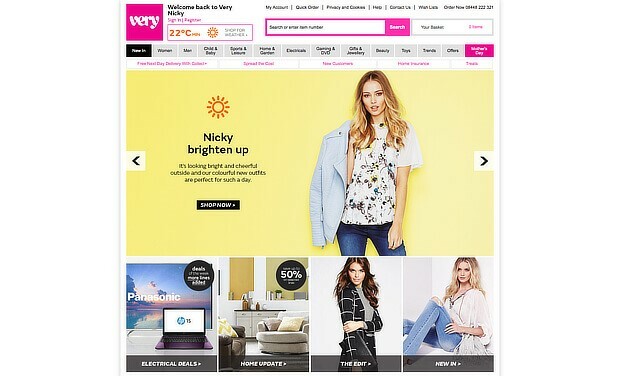 Wide consumer markets and stores across the world, such as eBay Australia and the Myer department store, have introduced virtual reality shops to their kitty. The underlying thought is that VR is able to give your customers a more immersive experience than the online one they have now. With VR, they can now browse the virtual products in an almost identical way as they would in a physical store. VR can create a rich, immersive and memorable customer experiences. This can translate into wonderful conversion rates. It is a boon for brand awareness. It gets customers talking about your brand, which they are then more likely to share on social media. It is the next best thing to physically holding a product. It gives the user a 3600 product view, and a much better perspective of what they’re buying. It breaks down language barriers, as it’s much easier to demonstrate a product’s attributes by showing (instead of telling). Both AR and VR are the best that it can get in terms of eCommerce product visualizations and they are likely to shape the future of eCommerce. Both AR and VR are the best that it can get in terms of eCommerce product visualizations and they are likely to shape the future of eCommerce. – Tweet This! Personalizing home and product pages and improving the overall UX of your eCommerce website is something which will continue to define future eCommerce trends in 2019. Most eCommerce stores know where their visitors are coming from or where they want the products to be shipped with the help of cookies or by asking them. And this is a valuable information which these stores are using to personalize their product pages. Let’s take this example from Allbirds. When you open their US store website, and visit a product page, the currency is, US Dollars and the size information is based on US shoe sizes. This is a good example of location-based personalization because the company anticipates the problems of their visitors and chooses to address them, making the customers feel special. Some stores like Rosemunde use geo-tagging to display relevant campaigns based on customer location. See how Very.co.uk personalizes its website to promote its products based on the weather. Incorporation of classic principles of good design with the innovation and possibilities of technology. Few eCommerce marketing trends that you need to look out for are Facebook Messenger Marketing, Instagram stories Influencer marketing, and omni channel marketing. 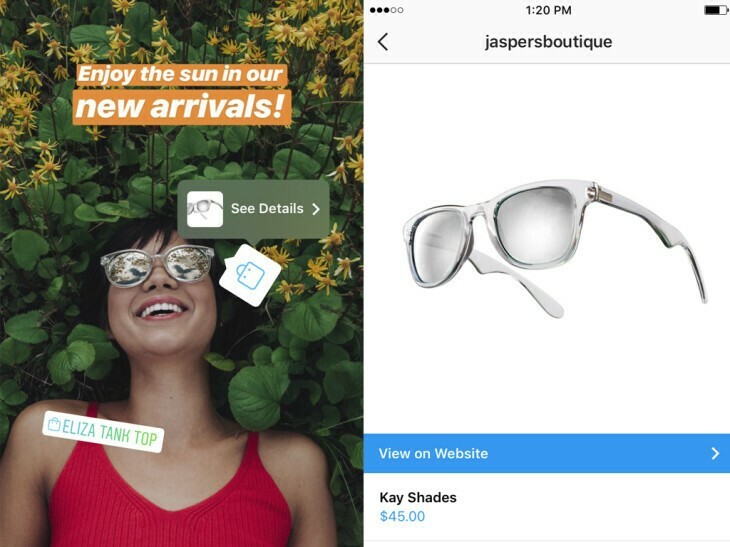 Brands worldwide are also using Instagram Shoppable posts to market and sale their products. Our own article on the Ultimate guide to Instagram for Shopify provides an in-depth insight on different ways in which you can use Instagram to sell your products. 2019 will see Instagram and Facebook stories becoming valuable platforms for nurturing an audience – be it to build an engaged audience or to sell products. Shoppable Instagram stories has made it rather easy to sell directly from your stories, allowing you to tag each item in the story, and it goes without saying that it has been working really well for retailers that sell fashion, beauty and homeware. The discussion of future eCommerce trends in 2019 is incomplete without talking about Facebook Messenger Ads. Facebook Messenger presently has more than 1.3 billion users, and 2 billion messages are exchanged between end users and businesses every month. Now, that’s a number to reckon with, isn’t it? Facebook Messenger is no longer just a messaging app; you can send photos and videos, money, share your location, play games, connect with groups and businesses and do more. Facebook Messenger Ads in its different forms – namely Sponsored Message Ads, Click to Messenger Ads – are totally revolutionizing how businesses market their products and are improving conversational commerce in more ways than one. Customers can now contact businesses and you can contact them in return through a chatting interface – an experience almost as good as a one-to-one interaction. Consumers are now increasingly reaching out to businesses through social media messages to get customer support or product recommendations, and brands are doing all they can to optimize this for marketing purposes. Whereas a standard Facebook ad sends people directly to a landing page, Messenger-style ads first engage customers without directly asking them to buy. With this, you don’t scare away non-brand-aware users with a heavy ask of leading them to your homepage. This feature creates an edge for Facebook Messenger ads over the standard Facebook ads. Shopify now offers Facebook Messenger as a sales channel for its merchants. With the help of this, customers engage with the store via chat, and enjoy a more personalized shopping experience. Brands now offer special product deals, update customers on their shipment and address queries – all through Messenger. Omnichannel, as the term suggests, means being present everywhere and serving your customers on whatever device, platform and medium they choose – providing them with a seamless and uninterrupted shopping experience. This includes replying to questions on social media, placing an order for them from your physical store (if it is out of stock online), saving their online sessions, allowing them to continue with it across devices, and so on. Omnichannel retailing is being seen as an future eCommerce trends in 2019 that is not going to go anywhere any time soon. Improved efficiency on the part of the retailers with respect to attending to customer queries and needs. Proper customer and transaction analytics that allow your marketing and retail experiences to focus on select target markets. Your customers have high expectations and very little time and patience. They expect you to customise their shopping experience, and given an option they would like to try out the product before they spend that money. So, no matter which retail and eCommerce trends in 2019 you choose from above, all of the eCommerce future trends have one thing in common – they make the shopping experience easier for consumers. So your intent should be to provide a seamless and engaging shopping experience for your customers. When you keep convenience and customer experience on top of everything else, you can be certain that you will gain a competitive edge over your competition in 2019.